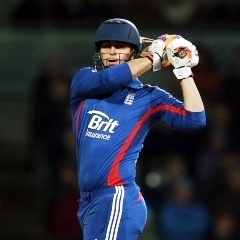 Birmingham - Jos Buttler's quickfire 32 not out provided the platform for England to beat South Africa by 28 runs in the third and final Twenty20 international at Edgbaston on Wednesday. Victory saw World Twenty20 champions England, who head to Sri Lanka on Thursday to defend the title they won in the Caribbean two years ago, square this three-match series at 1-1 with one no result. Most of Buttler's runs, in a match reduced by rain to 11 overs per side, came in a costly ninth over worth 32 from left-arm quick Wayne Parnell. It was the second most expensive over in Twenty20 international history after Yuvraj Singh struck England captain Stuart Broad for 36 runs made up of six sixes in Durban during the inaugural 2007 World Twenty20. England made 118 for five -- with man-of-the-match Buttler facing just 10 balls including three sixes and two fours. South Africa, who were never up with the rate, finished on 90 for five. Opener Craig Kieswetter made 50 off 32 balls with three sixes and three fours and together with Buttler, whose previous England best was 13, he put on 48 in 14 balls. South Africa fast bowler Morne Morkel's third ball of the match was a huge wide that sped past Proteas captain and wicket-keeper AB de Villiers on its way to the fine leg boundary, with 16 runs in all coming off the first over. But South Africa pulled things back in the second over when Parnell bowled recalled opener Michael Lumb middle stump. Luke Wright then holed out against off-spinner Johan Botha to leave England 43 for two in the fifth over. Botha took an impressive two for 19 in three overs but Kieswetter got England going again by launching fast bowling all-rounder Jacques Kallis for six over long-on. Buttler, at last replicating at England level the form he's often showed for Somerset, struck Parnell for two superb straight sixes in as many balls. And when Parnell twice no-balled, Buttler cleverly flicked the resulting free-hits over short fine leg for two consecutive fours. He then pulled him for six as 32 runs came of the over. Kieswetter then pulled Morne Morkel for six to complete his fifty only to be bowled next ball. South Africa suffered an early setback when the big-hitting Richard Levi was bowled by Tim Bresnan for one. And they lost Faf du Plessis for eight when he became debutant left-arm spinner Danny Briggs's first Twenty20 international wicket, the Hampshire bowler deceiving him in flight as the batsman hit across the line and got a leading edge to mid-off. Briggs took one for 16 in two overs. But Hashim Amla, a thorn in England's side throughout this summer, was still there, having hit his 100th four of the season in all formats. After six overs South Africa were 51 for two, needing a further 68 runs from their final five overs for victory. However, Amla fell for 36, off 27 balls with six fours, when he slogged off-spinner Graeme Swann to Jonathan Bairstow in the deep. That left South Africa 53 for four off seven overs and in the next over seamer Jade Dernbach conceded just two runs. From then on, there was no way back for the Proteas.